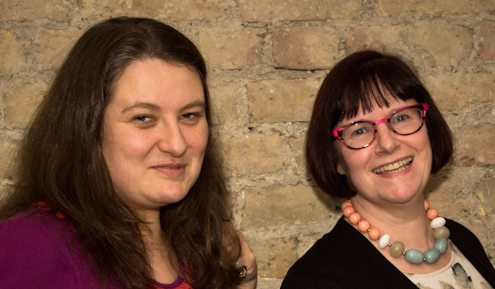 The Story Party was co-founded in 2013 by Beverley Glick and Mary Ann Clements (above). As speakers, writers and advocates of the power of story, we set up The Story Party to create a safe space in which to share personal stories that can deepen our connection to each other – stories that are personal but also universal; stories that speak volumes about what it means to be human. The way it works is that we set a theme and invite storytellers to share inspiring, entertaining and thought-provoking tales from their own Book of Life while a receptive audience listen from the heart – and also contribute anonymous audience tales. Our first event was held on September 17, 2013 in a private room at RSJ Restaurant near Waterloo. The theme was The Power of Stories, and we heard powerful and moving tales from our own Beverley Glick; Sarah Lloyd-Hughes, founder of Ginger Training & Coaching and the acclaimed Inspiring Speakers programme; CTI leadership coach and inspiring speaker Tony Barton; and Nick Williams, author, speaker and co-founder of Inspired Entrepreneur. You can listen to some of the stories from that first event here. Since then we have held several events each year, with different themes and many fantastic speakers. The hosting team has changed over time as well. Your current hosts are Beverley Glick and Jojo Thomas. Click here for more about the hosting team. The format has been so successful that several people who’ve visited have set up their own where they live. There are now Story Parties in Leeds, Portsmouth and Stroud, with Story Party Norfolk launching in February. If you are interested in being a storyteller at a future Story Party, please contact Beverley (info@beverleyglick.com) explaining why you would like to share a personal story. Sign up to get our weekly email featuring interviews, guest blogs, story tips and events news.